New and changed lesions at a glance. Automatic analysis of total body images. 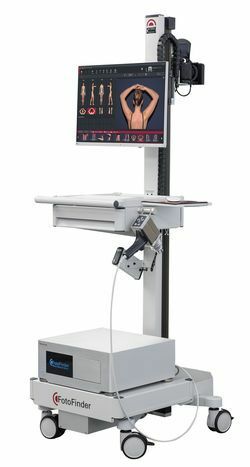 FotoFinder bodystudio ATBM is the only system with fully integrated Bodyscan. 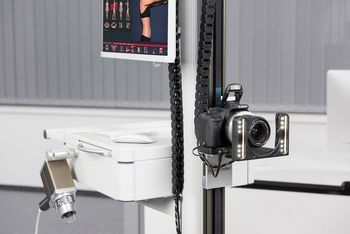 The expert system automatically compares the current full body photos with those from the last examination and helps you to identify skin changes. FotoFinder has long experience in skin analysis. The first version of the Bodyscan was developed in the year 2000 in collaboration with the Fraunhofer Institute for Biomedical Engineering IBMT, Germany. With the new Bodyscan ATBM, FotoFinder has revolutionized the automatic comparison of baseline and follow-up images once again. Both structural changes of existing nevi and recently developed moles are displayed. In this way, Bodyscan helps you to identify melanomas as early as possible. 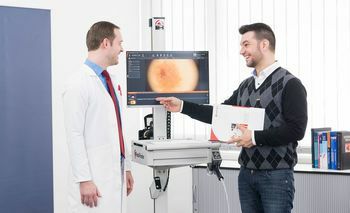 The Bodyscan results are available immediately after completion of the image acquisition and can be displayed with a single click. This procedure does not involve any distortion of the original images and speeds up follow-up examinations considerably!